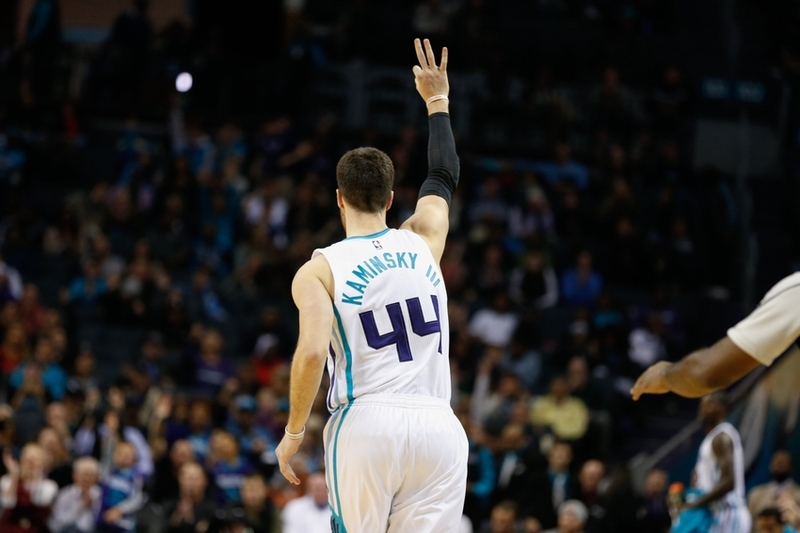 A look at why Frank Kaminsky’s recent success is promising for the Charlotte Hornets. After being drafted ninth overall in the 2015 NBA Draft, Frank Kaminsky has yet to warrant the Charlotte Hornets selecting him with a top-10 pick. The pick had immediate doubts, especially since the last stretch-4 Michael Jordan drafted was Adam Morrison. Many believed Kaminsky could turn into a starter or important bench player, nonetheless. Kaminsky showed some flashes during his rookie season. He had two 20-point games and a double-double in the regular season, as well as scoring 15 points against the Miami Heat in Game 3 of Charlotte’s first-round playoff series. Overall, though, Kaminsky was very inconsistent and everything that scouts worried about in his game occurred. He struggled on the glass and defensively, as well as not shooting the deep-ball as effectively as he did in college. His 7.5 points and 4.1 rebounds per game and 33.7 three-point percentage left a lot to be desired from the Hornets. Kaminsky has played nearly three more minutes per game to start the 2016-17 season due to Al Jefferson signing with the Indiana Pacers. He’s continued his inconsistent play early in the year, along with picking up an ankle injury, but a recent injury to power forward Cody Zeller opened up an even bigger role for Kaminsky. Kaminsky scored a career-high 23 points against the Memphis Grizzlies on Monday and over his last five games is averaging 15.0 points, 4.6 rebounds and 3.4 assists per game, while shooting 50 percent from the field and 38.4 percent from deep. All of his marks are significantly higher than his season and career averages. To be frank, Kaminsky is still mightily struggling on the glass and defensively. LaMarcus Aldridge bullied him down low on Wednesday night, finishing the game with 23 points. Sure, Kaminsky didn’t defend Aldridge the whole game, but too often San Antonio exploited that matchup in the paint. Not to mention Kaminsky is still a near non-factor on the glass at times. He is coming off a season-high eight rebounds against the Spurs, although, San Antonio had no trouble gaining better positioning on the offensive glass when Kaminsky was in the game. Also, he still has games like against Memphis when he grabbed zero rebounds in 20 minutes of action. Even with a career-high in points, zero rebounds is a tough pill to swallow when putting a 7-footer on the floor. Plus, Kaminsky rarely crashes the glass on offense. Part of the reason is he plays mostly on the perimeter, but even when he’s closer to the basket he runs back on defense without thinking about an offensive rebound chance. Despite being 7-feet, Kaminsky only ranks sixth in offensive rebounding for Charlotte. Small forward Michael Kidd-Gilchrist leads the Hornets with 1.8 offensive boards per game, compared to just 0.8 for Kaminsky. Even with his struggles on the glass and defense, Kaminsky is in the midst of the best stretch of his young career because of his offense. The Hornets knew when drafting him that his rebounding and defense probably would never become better than average for a 7-footer, but they wanted his offensive versatility and three-point shooting. That is what they have gotten in the past five games from Kaminsky. He’s scored at least 13 points in four of the past five games and has at least three three-point makes in three of five games. Zeller’s absence allows Kaminsky to be on the floor more and have a bigger role in the offense, and he is taking advantage of it and playing with a lot of confidence. It’s become evident in the past couple of weeks that Kaminsky is starting to find his offensive game in the NBA. He’s driving to the basket, working his defender inside and isn’t afraid to shoot a three when open. In fact, this is the first stretch of his career in which he’s attempted double-digit shots in five straight games. Part of it can be credited towards Charlotte’s injuries, but it’s also telling of how Kaminsky is searching for his shot more. Kaminsky has the offensive arsenal to take his defender off the dribble or use his 7-foot stature to shoot over someone. However, it only works if he uses it confidently and effectively, which is what’s happened over the past couple of weeks. For a player who has struggled through his first 90ish games, it’s a promising sign that he’s not discouraged and keeps attacking when given the chance. Kaminsky’s attitude shouldn’t shock the Hornets due to his development in college. He went from being a 1.8 points per game scorer as a freshman to the Big Ten Player of the Year as a senior, and leading his team to the national championship game. With Zeller returning from injury this week or next, Kaminsky has a challenge ahead of him. He needs to build on his recent success and continue to be a reliable scoring and shooting option off the bench. Fifteen points per game while shooting 50 percent from the field and 38.4 percent from behind the arc aren’t unrealistic expectations for a former top-10 pick if he continues to see around 23 minutes per game. After his up-and-down rookie season, Kaminsky was a top option off the bench for Charlotte because he’s their former top-10 pick, not because of a stellar rookie campaign. They want to develop him and see if he can become a reliable bench option. However, that phase doesn’t last forever, especially with all of Charlotte’s options in the frontcourt. The Hornets know what to expect from Marvin Williams, Spencer Hawes and Roy Hibbert, and Zeller is their unquestioned starting center. That leaves Kaminsky with the most to prove, but also with the most to gain. Even though Charlotte is only 14 games into the season, it’s important for Kaminsky to become a reliable option in their everyday rotation so he doesn’t fall out of it come playoff time. The Charlotte Hornets know Frank Kaminsky’s rebounding and defense won’t develop into All-NBA abilities, but they still have hope, and for good reason, that he can give them spacing as a stretch-four. He’s starting to come into his own and show that, but consistency has been his problem early in his career. Now is his time to show that he can be an offensive weapon every night, because he’s quickly becoming a liability and questionable play if his offense doesn’t show up. The love fest doesn’t last forever with top picks, and that could become clear to Kaminsky if he regresses back to his sub-par play. Everyone knows what Kaminsky can do, but he needs to show it on a nightly basis.